Sindhi Kerhi recipe by Mariam at PakiRecipes.com. 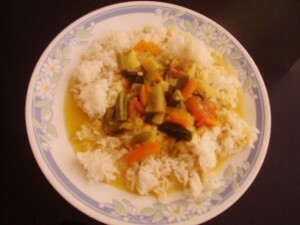 Signature sindhi dish, consisting of gramflour based curry cooked with variety of vegetables and served with boiled rice. Wash, peel and chop the vegetables into thick fingers or chunks. Heat ghee in a deep bottomed pan, add the chopped brinjal and fry till lightly crisp. Drain and keep aside. Add the ladys fingers, fry till lightly crisp, drain and keep aside. To the ghee , add all the masala seeds and allow them to splutter. Add the gram flour and stirfry till light brown. Add ginger , chillies, curry leaves , chopped vegetables and stir well. Add hot water and bring to a boil, stirring continuously to avoid lumps. Add turmeric , salt , sugar, tamarind extract and mix well. Simmer till the vegetables are 3/4th cooked. Add ladys fingers and brinjals. Simmer again till completely cooked.